Located only 35 minutes north of Toowoomba, Ravensbourne Forest Chalets allows you to relax and revitalise in the clear, fresh mountain air - and for those romantic summer evenings you can escape from the coastal humidity. All six "couple get away chalets" have double spa bath, log fires, reverse cycle air conditioning, full kitchen with a dishwasher, barbecue on secluded verandah and carport. The three deluxe queen spa chalets have a queen bed and the three deluxe king spa chalets have a king bed, surround sound, washing machine and dryer. Awaken to the call of the whip bird or cat bird, enjoy the relaxation of your own chalet or venture out to Lake Cressbrook or Ravensbourne National Park, both located only minutes away. Only 90 minutes from Brisbane, this getaway location offers the ultimate romantic experience with privacy and tranquillity. Ravensbourne Forest Chalets are nestled in a private rainforest, 600 metres above sea level, on 40 acres of picturesque undulating native forest. Ravensbourne is in the Crows Nest area of the Toowoomba Regional Council, 45 kilometres north of Toowoomba on the edge of the Great Dividing Range. Delicious breakfast, picnic lunch or barbecue dinner hampers are available as are massages. Each Chalet is fully self-contained with a full kitchen and dishwasher and a hooded barbecue on the Chalet verandah and a carport. The three Queen deluxe Spa Chalets contain queen sized beds and double spa baths. There are log fires, reverse cycle conditioning, DVD/CD players and all linen is provided. Food hampers and/or massages are available on request. 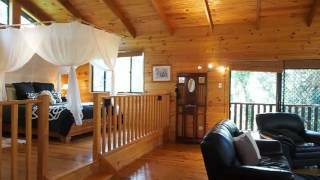 Each Chalet is set in private rainforest 90 minutes west of Brisbane. The three deluxe king spa chalets are fully self-contained with a full kitchen and dishwasher, washing machine and clothes dryer and a hooded barbecue on the chalet verandah, an outside courtyard and a carport. The chalets contain a king size bed and a double spa bath, a log fire, reverse-cycle air-conditioning, DVD and CD players surround sound and all linen is provided. One king deluxe spa chalet (Forest Grove) is on one level and is fully disability friendly for those who require assistance while maintaining the same level of luxury that is provided in all our deluxe king spa chalets. Food hampers and/or massages are available on request.